Introduction – MLT College Saharsa | A constituent unit of BNMU Madhepura. MLT College (Manohar Lal Tekriwal College) is a premier institution for Boys & Girls and well known in the Koshi region for its value based education, quality teaching and discipline. Established in the year 1952. 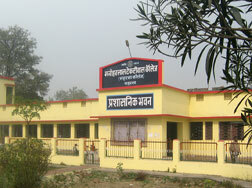 MLT College is a constituent unit of BNMU (B.N Mandal University), Madhepura. College is situated over 11.80 acres of land at the center of Saharsa District. College is registered under 2f & 12B of University Donation Foundation.In this college Co-education, Under Graduation in arts/Science and Post graduation Courses in History, Economics, English, Hindi, Maithili, Political Science and all subjects related to Science & Maths are available.College has rich laboratory for physics, Chemistry, Biology & an organized library with many rare books. There is a big playground & a hostel in this College. Instead of this college is study center of IGNOU(Indira Gandhi National Open University) & NOU(Nalanda Open University). Many professional courses like BCA & BIO-TECHNOLOGY(by UGC) is also available in this College.